Join the 900 companies participating in our Workplace Savings Program. Saving for college with the ScholarShare 529 plan can be worth thousands of dollars in tax advantages for your employees. The ScholarShare 529 Workplace Savings Program lets you provide this valuable benefit to your employees, at no cost to your organization. Our special employer-focused webinar (Wednesday, May 15, 11 a.m. - Noon PT) is designed to help you assess if our Workplace Savings program would be a good fit with you firm. Whether you are new to ScholarShare 529 or just looking for a refresher course, our employer webinar is a great way to find out everything you need to know. It was designed to educate HR and Benefits managers about our program. You can watch a pre-recorded webinar now or register to attend our next live webinar where a consultant can answer your questions. Chances are your employees with children are looking for ways to maximize their higher education savings. The ScholarShare 529 Workplace Savings Program gives employers an opportunity to take an active role in their employees' financial well-being. Already offer ScholarShare 529 to your employees? 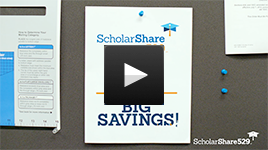 ScholarShare 529 Workplace Savings program?